France will introduce a new law by the end of the year to soften punishments for cannabis use, officials say. The legislation, a key promise of President Emmanuel Macron’s election campaign, will end prison terms for marijuana consumers. But the changes will stop short of decriminalising use of the drug, according to government spokesman Christophe Castaner. France is one of half-a-dozen countries in the EU that still criminalises cannabis use, in contrast to Portugal. Currently those caught using the drug in France face up to a year in jail and a fine of up to 3,750 euros. Castaner said on average drug offences take up six hours of police time, and the same for magistrates. Patrice Ribeiro, of France’s police officers’ union, is supportive of the proposed changes. Uruguay and a handful of US states, notably those on the west coast, have legalised recreational use of cannabis. 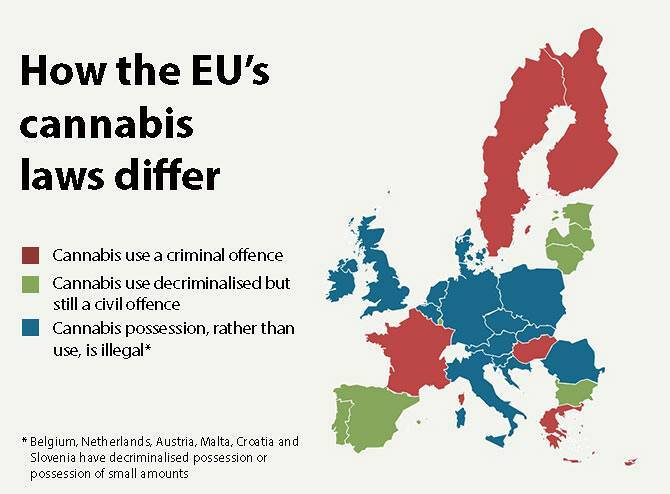 Cannabis use remains illegal in the EU, but it has been decriminalised – offenders commit a civil rather than a criminal offence and are often fined or given rehabilitation – in Portugal, Spain (only in public places), Luxembourg, Bulgaria, Estonia, Latvia and Lithuania.